Sky Harbor International Airport is a super-busy place -- so busy more than 43 million people passed through it in 2017. That’s about 120,000 passengers each day. But while massive amounts of people come and go, Phoenix’s super-busy airport doesn’t really feel all that busy. Sky Harbor recently underwent a massive modernization to enhance the customer experience, which includes the addition of the new John McCain III Terminal equipped with restaurants, shops, tech and luxury stores, a pet relief station, and the addition of a new ultra-modern pedestrian bridge. All this change started years ago when, in addition to construction, the powers that be decided to add some local flavor across the airport concourses. Additional Valley-based eateries will be added during the revamping process -- even a spot from a James Beard award-winning chef in 2020 -- but America’s Friendliest Airport is already winning when it comes to good eats. Here's everything you need to know about navigating the place right now. Pizza might just be the perfect food. Late night, early morning, whenever. A slice always satisfies. The pre-security pizza joint also serves beer, wine, and cocktails. And, if you’re in a rush you can take a pie or slice with you to your next destination. 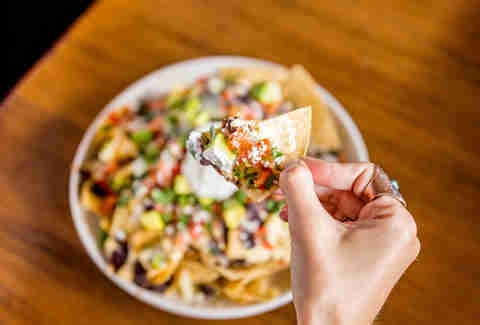 The restaurant and nano-brewery has recently expanded to Sky Harbor’s Terminal 2. The post-security taproom is equipped with plenty of TVs, they serve breakfast until 11am and you can expect to find comfort food on the menu such as pork wings, burgers, and apple pie with ice cream. There are 20 beers on tap. And growler fills are available. It’s a good place to hangout if you’ve got some time to kill. The award-winning Chandler-based craft brewery recently took up residence in the south concourse of Terminal 3. The brewpub is equipped with a dining room that offers sweeping views of the far-off mountains and tarmac where you can watch the plans come and go at Gate F7. There is also seating and standing room at the bar if you’d rather snag a pint of Mr. Pineapple on the fly. 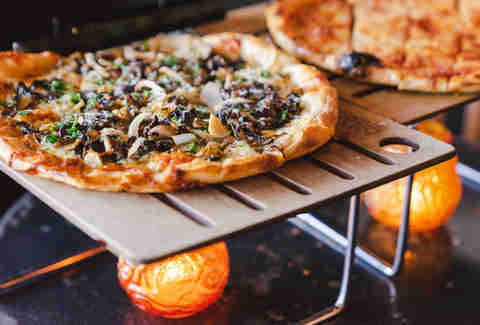 Locals fell in love with The Parlor for its wood-fired pizzas and award-winning cocktails. Now traveling gourmands from near and far can get a taste of what the Phoenix-based pizzeria has to offer. After all, they opened an airport location with intentions to elevate the food and hospitality experience for travelers. And they seem to be doing just that -- the new Sky Harbor spot resembles the aesthetic of the original and so does the menu. The first brick-and-mortar location of this popular Valley-based food truck is located within Sky Harbor’s Terminal 3. 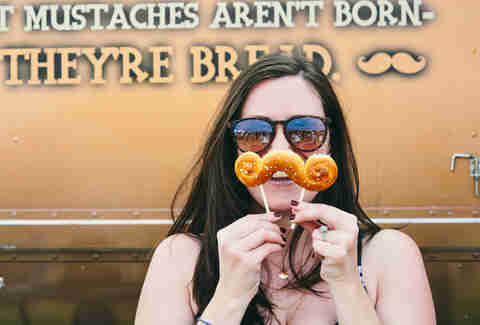 Travelers passing through the south concourse can order baked dough in the shape of mustaches on the go from Mustache Pretzels with choices that include cinnamon sugar, garlic and parm, or an option covered in salted caramel and an assortment of nuts. Mark Tarbell is sort of a big deal around Phoenix. So it only makes sense that the Valley restaurateur and chef would have his own spot that touts his namesake in the new terminal. The Tavern by Mark Tarbell is currently under construction inside of the south concourse (as of early January 2019) but plans to open in the future as part of the renovations currently underway at America’s Friendliest Airport. 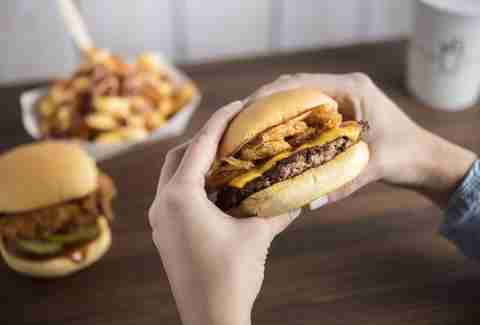 Expect to find your favorite Shack classics in addition to a selection of breakfast sandwiches at the airport location of the widely-popular burger joint hailing from Madison Square Park. Fans of Shake Shack can devour the iconic burgers and frozen custards from 5am to 10pm daily near Gate F7 of the south concourse. Barrio Café, led by Chef Silvana, is largely regarded as the best Mexican restaurant in Phoenix. So it only makes sense that the award-winning restaurant would have a presence inside of Sky Harbor. Here you can order the classic Arizona Burrito and wash it down with an ice-cold Tecate. Or, opt for a house specialty like the cochinita pibil. 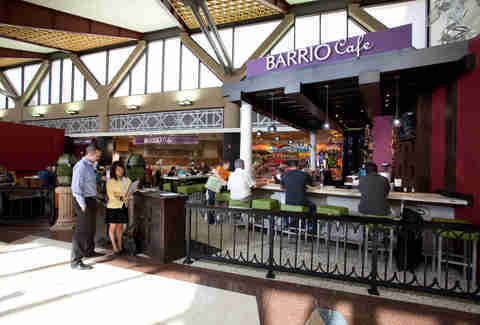 There is also Barrio Avion at Terminal 2, which has takeout options. Fans of the Gilbert barbecue joint can find some of their favorite slow-cooked barbecue inside of Terminal 4. The Joe’s Real BBQ menu features a selection of the same meal plates, sandwiches, and specialties all at a reasonable price. They even manage to make the cornbread in-house. Much like the Arcadia neighborhood original, this LGO location offers walk-up counter service and the same baked goods, sandwiches, pizza, and coffee selection that you’ve come to know and love. There are a couple beers on tap. You can find artisan gelatos here. And, you’ll probably want to pick up some of those LGO chocolate chip sea salt cookies everyone is always raving about. Lo-Lo’s airport location churns out homemade, soulful favorites just like the original. 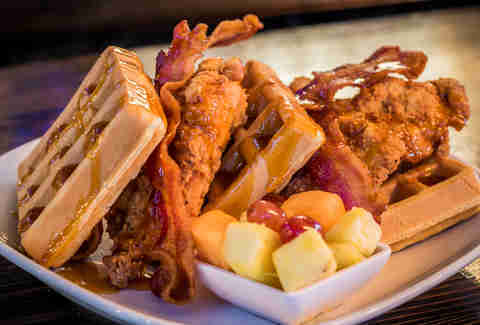 Bring your appetite, stay for awhile, and get-down on some fried chicken and fluffy golden waffles. But save room for their famous banana pudding or red velvet cake. A quick pit stop at Tammie Coe Cakes is a must when passing through the U.S. Airways concourse. Located at Gate A25, Tammie Coe To Go is your one-stop destination for something sweet including cookies, bars, and other locally-made sugary snacks. 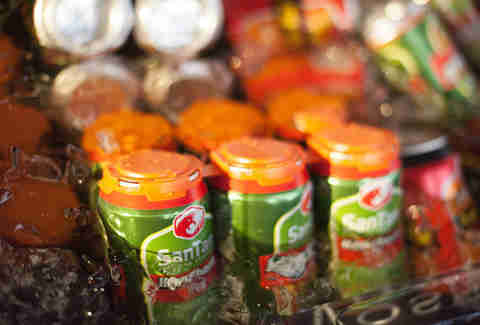 You can also snag last minute items like bottled or canned drinks here before boarding. The bar is well-stocked at this contemporary Mexican spot. For an airport restaurant there is an extensive tequila list which features blanco, reposado, and añejo options. In addition to tequila, Blanco’s bartenders serve margs, sangrias by the glass or pitcher, wines, and cocktails. Oh, and you can fill up on Mexican specialities including fajitas, tacos, cheese crisps, and breakfast burritos too, because, balance. You bet this hip Phoenix coffee shop has a location in the airport. Skip the corporate chains and treat your tastebuds to a cafe borgia or get going with a doppio espresso. 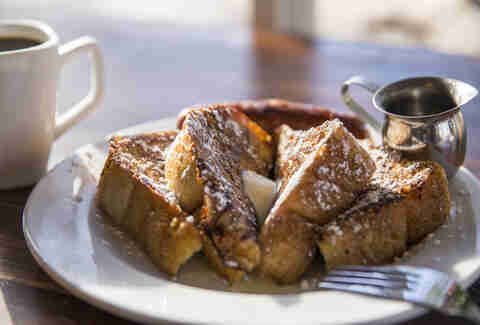 In addition to selection of great coffee and teas, Lola also offers all-day breakfast, lunch, and dinner which includes things like Cubano sandwiches as well as an assortment of pastries and muffins. 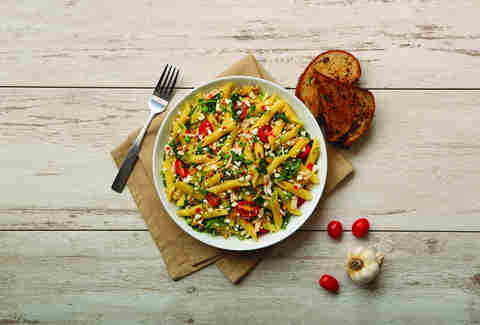 In a hurry and searching for something fresh and vegan, gluten-free or vegetarian-friendly? Pita Jungle at Gate B3 checks all of the boxes. The order-at-the-counter outpost of the mediterranean eatery provides travelers with a healthy selection of pitas, wraps, bowls, salads, and soups. Hopping on red-eye? Departing before the sun is up? Wildflower, which is located in a pre-security area at Gate A9, is open 24 hours and offers breakfast, lunch, and dinner options. The award-winning bakery/resto has been a Valley favorite for over 20 years for its fresh-baked breads and pastries, which we must say make for a great snack once you’re 30,000-feet up. Travelers can find Nocawich and Nocawich Express at Gate C2 and Gate C3. Creative takes on bagels and breakfast specialities are on the menu here. And you can also find a substantial selection of grab-and-go signature sandwiches and salads. 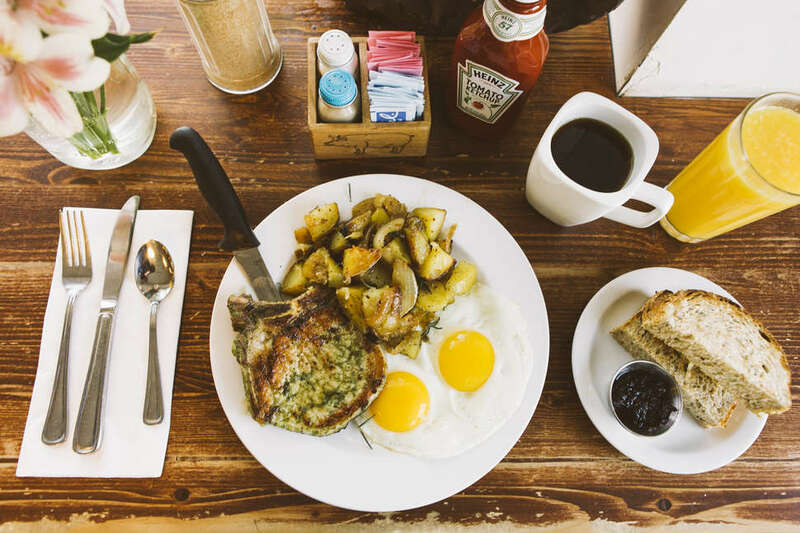 All day breakfast is the standard at Matt’s. The salami scramble, made-from-scratch griddle cakes, and Sonrisa burrito are always good choices. After 11am you can get your hands on eats like the Niman Ranch burgers, fully-loaded salads, sandwiches, and even meatloaf. Matt’s Big Breakfast also has a lineup of cocktails, wine, beer, coffees and teas as well as fresh-squeezed lemonade and orange juice. Find it all at Gate B5. You can also snag a coffee at their new Terminal 3 outpost Giant Coffee. This upscale French-inspired dining establishment near Gate C11 is redefining “airport food.” The Parisian-esque resto features items such as pâté maison, mussels direct from Washington State, dungeness crab crêpes, and traditional onion soup. And those are just some the starters. Main courses include dishes like the grilled chicken paillard and the Zinc omelette with French ham, gruyère, crème fraîche, and straw potatoes. There’s even an approachable dessert selection which includes tasty items like lemon ricotta beignets and chocolate brioche bread pudding. A full bar is also available, of course. When you cross from your plane to the jet bridge one thing is instantly clear: Phoenix temps are astronomically higher and hotter than wherever you just came from. We call it ice cream weather. Find relief at Gate B5’s Sweet Republic. The recipient of numerous accolades, this Scottsdale-based artisan ice cream shop does more than just scoop the classics. 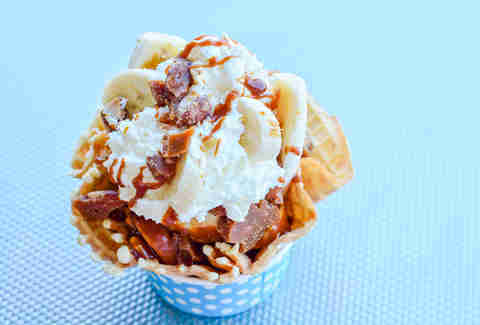 Sweet Republic is known for its inventive handcrafted ice cream flavors made with local and all-natural ingredients. So you can indulge without the guilt. Lauren Reichert is a Phoenix-based photographer and writer. Follow her on the ‘Gram @hungryinphoenix.